Amazon on Wednesday announced it will be holding a special media event on June 18 for an as-yet-unannounced product that many expect will be the Internet retailer's first foray into the smartphone business. The photo above, which appears to be an Amazon branded portable, is accompanied by a teaser video showing people handling a small device and commenting on what looks to be 3D motion tracking technology. Interestingly, the pictured device -- at least the one corner that is revealed -- is nearly identical to to renders purportedly leaked in April. At the time, it was reported that Amazon's graphic designers created the images. In October, AppleInsider reported exclusively on Amazon's rumored device, noting the smartphone will likely sport six cameras for 3D imaging, a 4.7-inch touchscreen display and Qualcomm Snapdragon processor. The three-dimensional user interface is expected to be the handset's main draw, with users able to manipulate onscreen objects like wallpapers and icons via gestures. From the video released today, it looks like the phone will react to head motions as well, offering an enhanced type of parallax view seen in Apple's iOS 7. Amazon's event is slated for June 18 and those interested can request an invitation through a special page the company's website. users able to manipulate onscreen objects like wallpapers and icons via gestures. From the video released today, it looks like the phone will react to head motions as well, offering an enhanced type of parallax view seen in Apple's iOS 7. Seriously head movements? How many people are using Samsung's smart scroll and gestures over phone? Soon we will have another category. On the otherside : Glassholes. On this side : Amazholes. Hey Jeff, get ready to add the ability to turn that parallax option off due to the migraines the users will complain about. A month ago (or so) I visited my Amazon page and noticed there was a simulated 3-D book in place of the usual spot where one would see a book cover, and I was able to slightly rotate the book using my cursor. I think it may have been a placeholder for what they are planning here. Also, I should note that I saw no value in seeing a book in 3-D.
Nintendo is pretty sure portable 3D screens are the future. Pretty sure. Well I guess that makes me an Apphole then. This is great for people with no fingers. They'll sell hundreds of "aPhones"
I don't think it matters so much what Amazon does with 3D sensing. If the phone has this capability, good developers will find many innovative ways to utilize it. I think it's a good addition. Hopefully Apple is working in this space. However, six cameras is a lot of space to use up in a phone. My guess is that Apple will come up with a more elegant solution and provide the same functionality in a smaller device. It may take them a few years longer. Amazon is into a little to much hardware. And folks with one or no functioning eyes. Once it's announced, the DOJ will announce they are investigating Apple's free OS. it takes the device to do things when it's 3/4 full of books. a bit of a novelty until apps utilize the technology. Gotta love Bloomberg. They have three stories on this and all of them are about how Amazon is taking on the iPhone. Kind of amusing considering every chance they get they let us know how Apple is doomed and Android rules the world. Yet with Amazon's new phone Bloomberg apparently thinks only Apple will be impacted. i heard a rumor that Amazon is going to be using AT&T's sponsored data plan. I'm sure whatever Amazon does they'll make sure the phone is heavily subsidized. Wall Street doesn't care if they make money so that's easy to do. You mean like Virtual Boy? 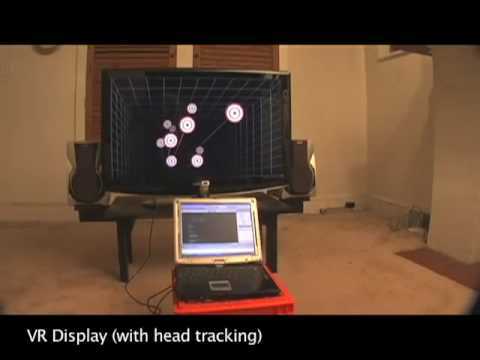 I'm pretty sure the "3D" tech in Amazon's smartphone will basically be a commercial implementation of this tech demo from 2007 except tracking your eyes directly instead of requiring an a pair of infrared light sources stuck to your head. It's not true 3D but I find the illusion even better and it' much easier on the eyes. Seems resource intensive for a mobile device but it still strikes me as odd that no-one has really pursued this until now. Of course the illusion only works for one person per display but that's a pretty safe assumption to make for a mobile device.